The DUP is set to end its 16-year boycott of a body set up to strengthen British and Irish parliamentary links. The party will make an hour-long presentation to the British-Irish Interparliamentary Body when it meets in Killarney, County Kerry on 24 April. It is understood Ian Paisley's party will not be taking its seats on the body, but will make a presentation. The UUP continues to boycott the body, which was established in 1990 to "contribute to mutual understanding". Jeffrey Donaldson, DUP, said his party was doing the presentation to set out the unionist viewpoint. "Let me be clear, just because we are doing that doesn't mean we recognise that the body in itself has a particular role to play," he said. "We are simply putting the unionist case to people who take an interest from a parliamentary perspective." Mr Donaldson said the DUP, like everyone in Northern Ireland, was trying to move forward. "We are trying to reach out to people that perhaps in the past we haven't engaged with," he said. "We feel that it's important that those people hear the unionist message, it doesn't mean that we dilute that message in any way." Before engaging with the body, UUP leader Sir Reg Empey said his party wanted to "negotiate a clear fresh start" away from its links to the Anglo-Irish Agreement process. Sir Reg said they were "open" to engaging with the body, "but obviously it has to be taken further forward so we haven't been participating and won't be until we get that arrangement resolved". He said the body was set up at the "tail end" of the 1985 Anglo Irish Agreement process, which prompted unionist outrage by giving the Irish Republic a consultative role in Northern Ireland. Democratic Unionist deputy leader Peter Robinson will lead the delegation which also includes fellow Westminster MPs Iris Robinson, Nigel Dodds and Jeffrey Donaldson. 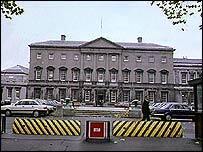 The 68-member British-Irish Interparliamentary Body was established as a link between Westminster and the Dail. It initially comprised 25 British and 25 Irish members drawn from the upper and lower houses of both parliaments. In recent years the membership of the body has been extended with representatives from the Welsh Assembly, the Scottish Parliament, the Northern Ireland Assembly and the Isle of Man and Channel Islands. Last year, former Northern Ireland Secretary Paul Murphy was appointed as its co-chairman.